The "Melt Up" is undisputedly here. I can prove it simply by showing you two charts. These two charts prove that my thesis for U.S. stocks is moving along according to plan... and that some of the biggest gains of this bull market could still be ahead of us. In short, the Melt Up is here. And that means you really want to own U.S. stocks now. The Melt Up is the final push of a bull market. It's when the leading companies of this near-decadelong boom REALLY take off... and propel the overall market dramatically higher. Importantly, the Melt Up won't necessarily lift all stocks. In fact, the last time around, most stocks didn't soar in the Melt Up. And I believe that could be true this time, too. 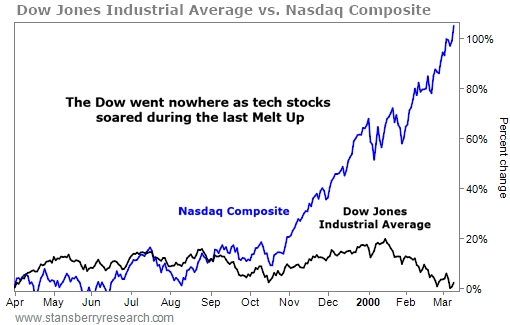 Of course, the last true stock market Melt Up in the U.S. happened during the tech bubble of the late 1990s. The entire market had soared through the '90s. The old fuddy-duddy companies made huge gains right alongside the exciting new Internet stocks. But that changed as the bull market neared its end and the Melt Up took over. The Dow basically went nowhere for the final 12 months of this stock market Melt Up, while tech stocks soared triple digits. The beginning of that major outperformance is what signaled the Melt Up getting fully underway. And for the first time since the last Melt Up, that's happening right now. That's a big change. Until now, boring stocks and exciting tech stocks had soared together. The rising tide of recent years has lifted all ships. Things have changed in recent months, though. We've seen a major shift in performance. This is a first... And it's big news. 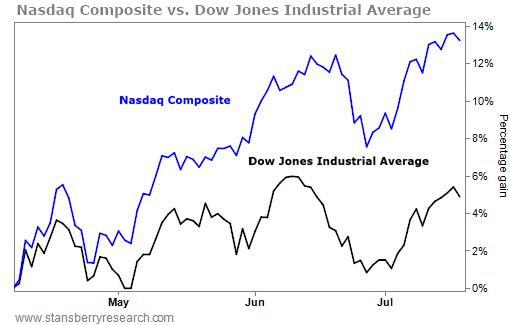 Since early April, the Nasdaq has dramatically outperformed the Dow. And it has hit new all-time highs along the way. This is exactly what we saw in the late 1990s. It's what signaled the final stages of the Melt Up back then... And it's what happened right before a massive, triple-digit boom in tech stocks in just 12 months. We've been waiting and wondering, but this is our signal. The Melt Up is officially underway. The final stage of this bull market is likely to play out over the next 12 to 18 months as a result. The takeaway is obvious: We want to own U.S. stocks right now. Specifically, we want to own exciting U.S. tech stocks. This isn't a time to be worried about the market. This is the time to be bullish and buy. Don't miss this. Get on board now. "Over the last 40 years, whenever this indicator crossed below zero on the chart, a stock market bust and a recession followed," Steve writes. "And lately, it's been inching closer to 'danger.'" Read more here: Exactly When the Stock Market Will Peak, Revisited. Back in May, Steve shared two of his most reliable early warning indicators. See what they're saying right here: What the Early Warning Indicators Say Now. 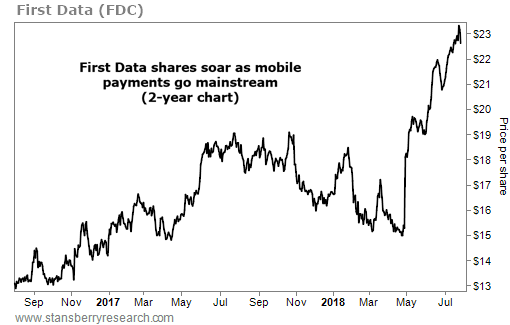 Financial-technology leader First Data (FDC) provides solutions to secure and process transactions. The company works with more than 6 million business locations and 4,000 banks across the world to handle payments. And having such a large customer base is paying off… In the most recent quarter, First Data reported net income of $341 million, up 84% from the same quarter in 2017.